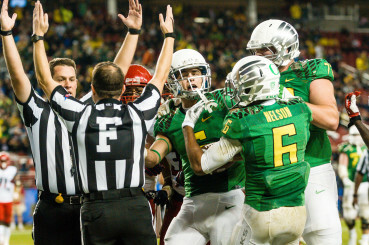 Can Oregon’s Offense Work Without a Star QB? With the NFL draft rapidly approaching and mock drafts coming in from every analyst with an internet connection, Oregon fans are getting used to the bittersweet feeling of seeing star alumnus Marcus Mariota top nearly every board in the country. Sweet because we love to see a young Duck take wing. Bitter because of the empty nest he’s leaving behind. Mariota owns nearly every Oregon record relevant to his position, including both career and single-season crowns in passing yards, pass completions, total offense, touchdowns and points accounted for. 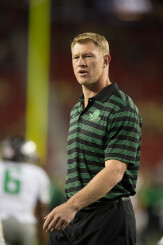 Oh — and by the way, he’s also the Oregon record holder in College Football Playoff wins and Heisman Trophies. The Honolulu kid ran both the football and the offense to perfection, executing the Helfrich hurry-up with a poise and efficiency that dazzled the college football world, then hustled to the line and dazzled it again before it got the chance to substitute. It’s no secret that the Oregon brand of football puts a lot of emphasis on quarterback play, from a required ability to cover ground with his legs to a critical capacity for quick reads before and after the snap. While blue-chip transfer Vernon Adams has speed comparable to Mariota’s (4.58 in the 40, to Mariota’s 4.52), he hasn’t been practicing college football at all since last fall, and has never played in Oregon’s system. Backups Morgan Mahalak and Jeff Lockie are both significantly slower, and neither — yet — has shown the flashes of brilliance we’re used to from the likes of Mariota, Dennis Dixon and Darron Thomas. The Quack attack is predicated on an ability to strike at any time, in any way. If the QB can’t run, the Ducks lose the zone read and the triple option. If he can’t throw, they can’t spread the field and the whole thing falls apart. 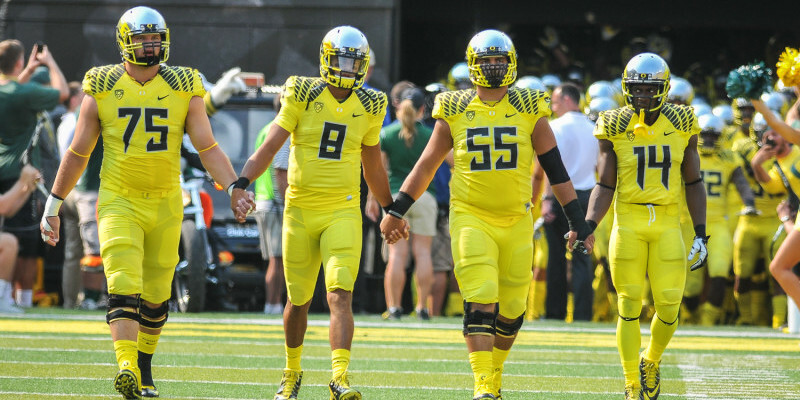 Fortunately for the Autzen faithful and Duck fans everywhere, Dixon, Thomas and Mariota — Oregon’s QBs since 2005, excluding the conflict-laden case of Jeremiah Masoli — averaged over 500 rushing yards a year on 5 yards per carry, and completed 61.15 percent of their throws for 2687 yards per full season. The three averaged a passing efficiency rating of 155.78 over the course of their eight seasons as starters, and threw 206 touchdowns, a little over 2 per game for 101 games including the postseason. Those are some impressive numbers. 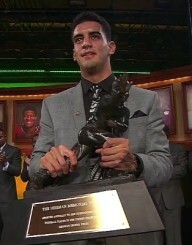 So the question, then, is this: Does Oregon build great quarterbacks, or have great quarterbacks built Oregon? Tempo: The quickness of Oregon’s every down offense puts young QBs in relatively simple read situations. Usually there are few plays to choose from, and if one in particular isn’t relayed down to the field before the offense even gets to the line, it’s usually a nearly binary read. How many defenders in the box? 6+ means one play, 5 or fewer means another. Further, the defense rarely gets to substitute against Oregon’s greenlight tempo, which puts receivers in favorable matchups to create big windows, and forces any base coverage to be relatively generic and never sell out and pin its ears back to totally shut down one play or another. Conditioning: Marcus Mariota showed up in Oregon a lanky 6’4″, 185 lb kid with a mediocre 4.71 40 time. He weighed in at 222 lbs at the NFL combine in February, and ran a blistering 4.52 40, best among rookie quarterbacks. Everyone knows the Ducks are fast. That’s something you can see on TV. What often takes opponents and scouts by surprise is how long they stay fast. Mariota, Thomas, Dixon and company saw a lot of hands on hips when they looked over the line, and quite soon afterward they usually saw a lot of green. So don’t throw out that pig cooker just yet. Scheme: The crux of the Kelly/Helfrich offense is matchups. Find the important spots, and outnumber, outrun or avoid the defense wherever possible. What that means for a quarterback is that he’s always taking advantage of mistakes. Busted coverages, broken containment and trapped defenders are the hallmark of the Ducks’ devastating design, and that means big windows to throw into and big holes to run through, a quarterback of any age’s dream. That isn’t the whole story, of course. All three of the aforementioned quarterbacks except Mariota played pro ball somewhere, and Marcus is projected to be a top ten overall pick. They’re talented guys, smart guys, fast guys. But miss them as we may, football will continue in Eugene, stars or none.